Hundreds of men, women and children made their voices heard at the 2018 Psych Congress in Orlando. The Citizens Commission on Human Rights held a demonstration in Orlando at the Psych Congress protesting the drugging and shocking of children. 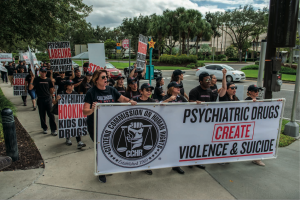 ORLANDO, FLORIDA, UNITED STATES, October 31, 2018 /EINPresswire.com/ — The Citizens Commission on Human Rights (CCHR), a non-profit mental health watchdog dedicated to the protection of children, held a demonstration in Orlando at the Psych Congress protesting the drugging and electroshocking of children. Marching through the streets to the chant of “Don’t Drug Our Kids! Don’t Shock Our Kids! Leave Our Kids Alone!” hundreds of men, women and children made their voices heard at the 2018 Psych Congress in Orlando. Organized to raise awareness on the labeling, drugging and electroshocking of children by the Florida chapter of CCHR, the protest received tremendous support from those witnessing the event. In light of the fact that the FDA admits ECT can cause cardiovascular complications, memory loss, cognitive impairment, brain damage and death and that psychiatrists admit they do not know how ECT “works,” CCHR is calling upon the state of Florida to ban the electroshock (ECT) device. Those interested are asked to sign the petition. To learn more, please call 727-442-8820 or visit www.cchrflorida.org.